"If this were some ordinary recession of the sort we've had before, rather than an almighty great international financial crisis in our banks, then we might have something to apologise for... and if it were only taking place in this country, and not round the world, then probably some blame would attach to ourselves here. But neither of these things is true." 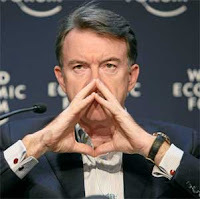 Lord Mandelson also said that Britain's chairing of the summit should be an antidote to national pessimism. "Why don't people take a pride in our country and say 'who's giving a lead here internationally?' "